SPRING SPORTS 2018: PAGE 3 PRESS & DAKOTAN ? 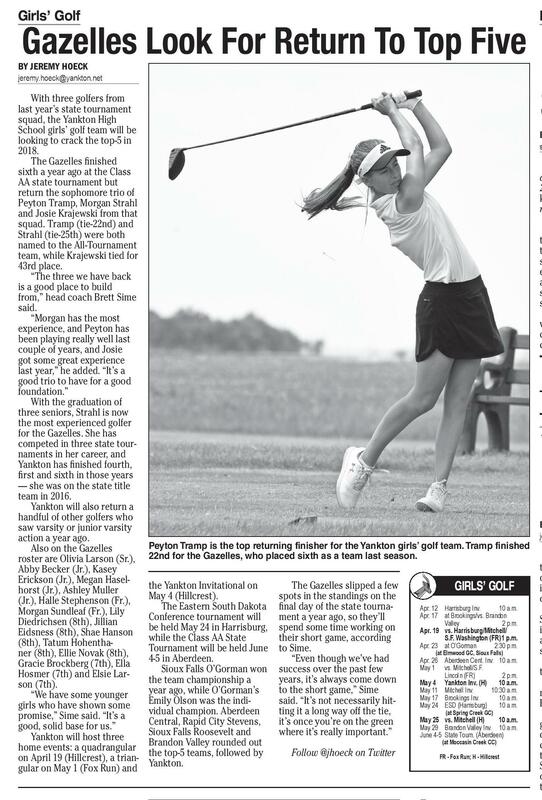 PLAIN TALK Girls’ Golf Gazelles Look For Return To Top Five BY JEREMY HOECK jeremy.hoeck@yankton.net With three golfers from last year’s state tournament squad, the Yankton High School girls’ golf team will be looking to crack the top-5 in 2018. The Gazelles finished sixth a year ago at the Class AA state tournament but return the sophomore trio of Peyton Tramp, Morgan Strahl and Josie Krajewski from that squad. Tramp (tie-22nd) and Strahl (tie-25th) were both named to the All-Tournament team, while Krajewski tied for 43rd place. “The three we have back is a good place to build from,” head coach Brett Sime said. “Morgan has the most experience, and Peyton has been playing really well last couple of years, and Josie got some great experience last year,” he added. “It’s a good trio to have for a good foundation.” With the graduation of three seniors, Strahl is now the most experienced golfer for the Gazelles. She has competed in three state tournaments in her career, and Yankton has finished fourth, first and sixth in those years — she was on the state title team in 2016. Yankton will also return a handful of other golfers who saw varsity or junior varsity action a year ago. Also on the Gazelles roster are Olivia Larson (Sr.), Abby Becker (Jr.), Kasey Erickson (Jr.), Megan Haselhorst (Jr.), Ashley Muller (Jr.), Halle Stephenson (Fr. ), Morgan Sundleaf (Fr. ), Lily Diedrichsen (8th), Jillian Eidsness (8th), Shae Hanson (8th), Tatum Hohenthaner (8th), Ellie Novak (8th), Gracie Brockberg (7th), Ella Hosmer (7th) and Elsie Larson (7th). “We have some younger girls who have shown some promise,” Sime said. 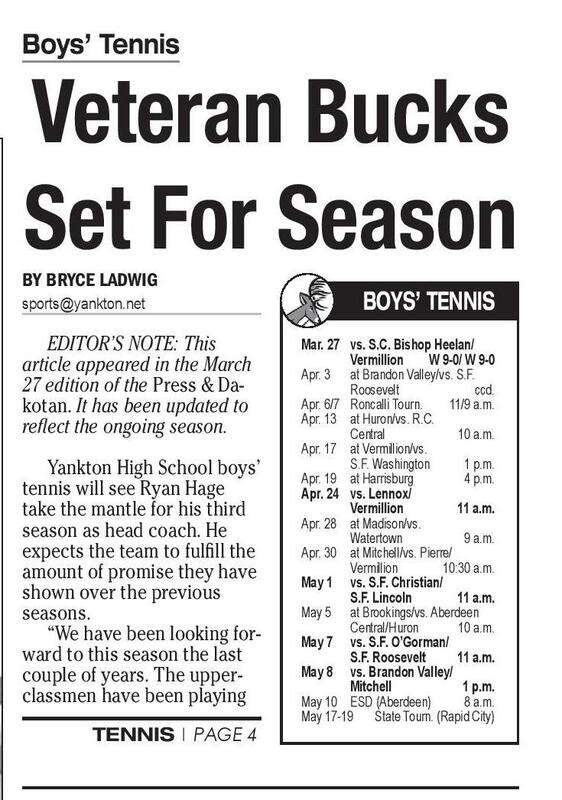 “It’s a good, solid base for us.” Yankton will host three home events: a quadrangular on April 19 (Hillcrest), a triangular on May 1 (Fox Run) and Boys’ Tennis Veteran Bucks Set For Season BY BRYCE LADWIG BOYS’ TENNIS sports@yankton.net EDITOR’S NOTE: This article appeared in the March 27 edition of the Press & Dakotan. It has been updated to reflect the ongoing season. Yankton High School boys’ tennis will see Ryan Hage take the mantle for his third season as head coach. He expects the team to fulfill the amount of promise they have shown over the previous seasons. “We have been looking forward to this season the last couple of years. The upperclassmen have been playing TENNIS | PAGE 4 Mar. 27 vs. S.C. Bishop Heelan/ Vermillion W 9-0/ W 9-0 Apr. 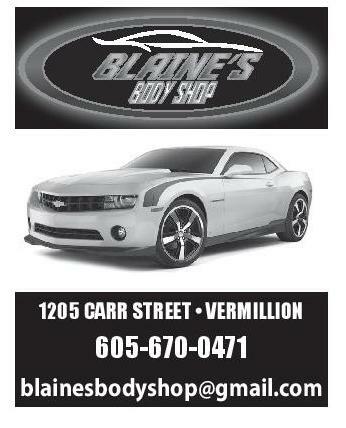 3 at Brandon Valley/vs. S.F. Roosevelt ccd. Apr. 6/7 Roncalli Tourn. 11/9 a.m. Apr. 13 at Huron/vs. R.C. Central 10 a.m. Apr. 17 at Vermillion/vs. S.F. Washington 1 p.m. Apr. 19 at Harrisburg 4 p.m. Apr. 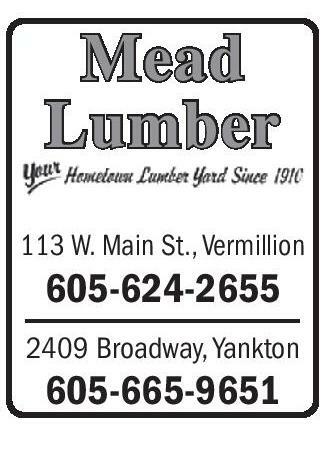 24 vs. Lennox/ Vermillion 11 a.m. Apr. 28 at Madison/vs. Watertown 9 a.m. Apr. 30 at Mitchell/vs. Pierre/ Vermillion 10:30 a.m. May 1 vs. S.F. Christian/ S.F. Lincoln 11 a.m. May 5 at Brookings/vs. 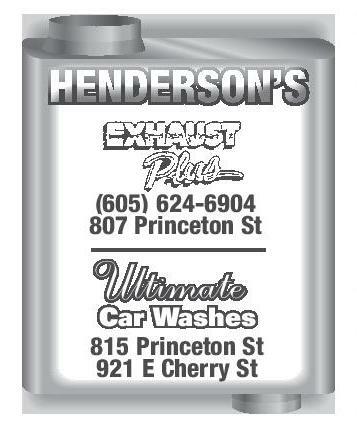 Aberdeen Central/Huron 10 a.m. May 7 vs. S.F. O’Gorman/ S.F. Roosevelt 11 a.m. May 8 vs. Brandon Valley/ Mitchell 1 p.m. May 10 ESD (Aberdeen) 8 a.m. May 17-19 State Tourn. (Rapid City) Trap Shooting Yankton Squad Continues To Grow After Strong Inaugural Season Andrew Schieffer, Ty Schultz, Mitchell Slowey, Austin Peyton Tramp is the top returning finisher for the Yankton girls’ golf team. Tramp finished Wagner, Jonathan Wenisch, 22nd for the Gazelles, who placed sixth as a team last season. A large roster right out of Nicholas Woerner, Isiah the gate. A fourth-place finish Woods and Austin Wooton. Also back are the followout of 21 teams at state. Two The Gazelles slipped a few the Yankton Invitational on GIRLS’ GOLF ing five girls: Katie Hammond, individual runner-ups. Five spots in the standings on the May 4 (Hillcrest). Danielle Herrlein, Lanna other all-state selections. The Eastern South Dakota final day of the state tournaApr. 12 Harrisburg Inv. 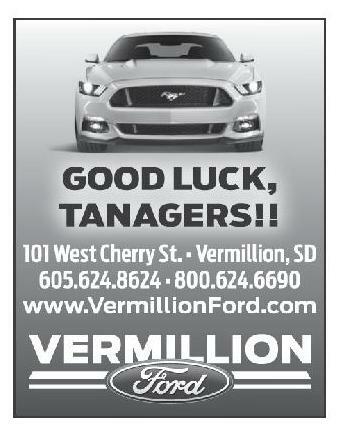 10 a.m. Lane, Haley McCloud and Year one of Yankton High Apr. 17 at Brookings/vs. Brandon ment a year ago, so they’ll Conference tournament will Destiny Pesek. School’s club trap shootValley 2 p.m. be held May 24 in Harrisburg, spend some time working on That group helped YankApr. 19 vs. Harrisburg/Mitchell/ ing team in 2017 was, by all S.F. Washington (FR) 1 p.m. their short game, according while the Class AA State ton finish third in its conferaccounts, an unquestioned Apr. 23 at O’Gorman 2:30 p.m. Tournament will be held June to Sime. ence competition (behind success. (at Elmwood GC, Sioux Falls) “Even though we’ve had 4-5 in Aberdeen. Apr. 26 Aberdeen Cent. Inv. 10 a.m. So, what’s different in year Pierre and Platte) and then May 1 vs. Mitchell/S.F. Sioux Falls O’Gorman won success over the past few fourth at the state shoot out two? Lincoln (FR) 2 p.m. years, it’s always come down the team championship a May 4 Yankton Inv. (H) 10 a.m. of 21 teams. “There’s more exciteMay 11 Mitchell Inv. 10:30 a.m. to the short game,” Sime year ago, while O’Gorman’s Five of Yankton’s returning ment,” said head coach Mike May 17 Brookings Inv. 10 a.m. said. “It’s not necessarily hitEmily Olson was the indiboys members earned AllRockne. May 24 ESD (Harrisburg) 10 a.m. ting it a long way off the tie, vidual champion. Aberdeen (at Spring Creek GC) State honors a year ago (finLast year was the inauMay 25 vs. Mitchell (H) 10 a.m. it’s once you’re on the green Central, Rapid City Stevens, ishing in the top-50): Hento, gural season for Yankton May 29 Brandon Valley Inv. 10 a.m. where it’s really important.” Sioux Falls Roosevelt and June 4-5 State Tourn. (Aberdeen) Moderegger, Sawtell, Slowey offering trap shooting as a (at Moccasin Creek CC) Brandon Valley rounded out club sport and the combined and Hunter Rockne. And two Follow @jhoeck on Twitter the top-5 teams, followed by girls members earned second team finished fourth at the FR - Fox Run; H - Hillcrest Yankton. place in their respective South Dakota State Shoot — divisions at the state shoot: one clay pigeon away from Herrlein and Lane. third place. 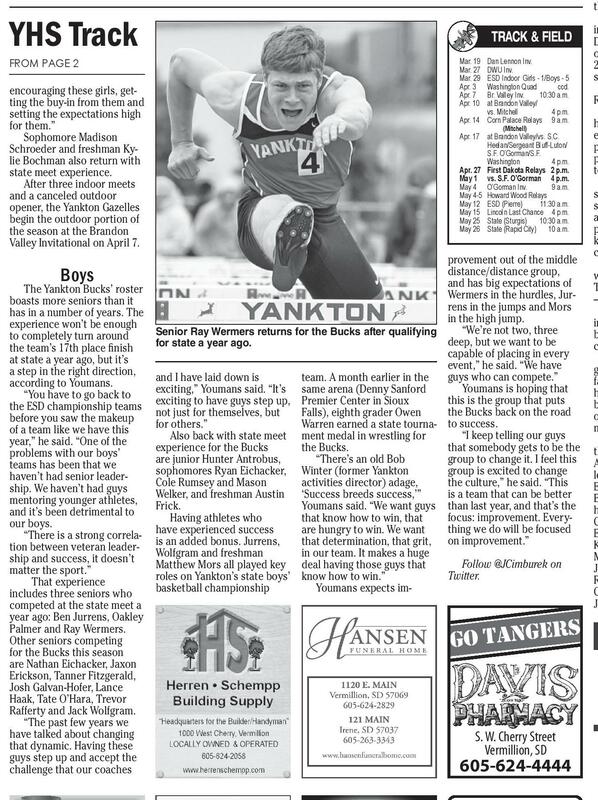 After that success, It’s a sport that has Yankton was able to add 13 increasingly grown in South TRACK & FIELD newcomers to the roster for Dakota: From seven teams the 2018 season. offering the sport in 2016, to Mar. 19 Dan Lennon Inv. FROM PAGE 2 The boys’ newcomers 21 last year and now 36 this Mar. 27 DWU Inv. include: Jake Cunningham, spring. Mar. 29 ESD Indoor Girls - 1/Boys - 5 Apr. 3 Washington Quad ccd. “It’s growing like wildlife,” Keagan Holmstrom, Wyatt encouraging these girls, getApr. 7 Br. Valley Inv. 10:30 a.m. Holmstrom, Arion Huntley, Rockne said. ting the buy-in from them and Apr. 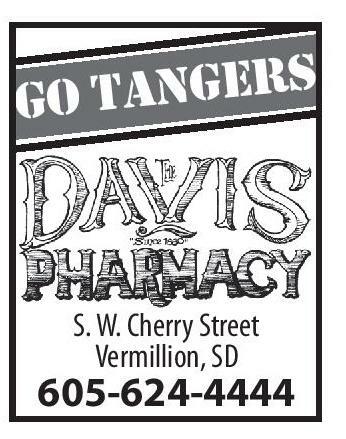 10 at Brandon Valley/ vs. Mitchell 4 p.m. Josh Loest, Landon Moe, The appeal of the sport, setting the expectations high Apr. 14 Corn Palace Relays 9 a.m. Collin Nickels, Blair Pokorny, he added, was that literally for them.” (Mitchell) everyone can join and partici- Ben Rumsey, Payton SilverApr. 17 at Brandon Valley/vs. S.C. Sophomore Madison Heelan/Sergeant Bluff-Luton/ nail, Jakob Strom and Nichopate, and their involvement Schroeder and freshman KyS.F. O’Gorman/S.F. las Taylor. The lone girls’ plays a direct role in the lie Bochman also return with Washington 4 p.m. Apr. 27 First Dakota Relays 2 p.m. newcomer is Kylie Auch. team’s performance. state meet experience. May 1 vs. S.F. O’Gorman 4 p.m. The Yankton participants “You don’t have to be a After three indoor meets May 4 O’Gorman Inv. 9 a.m. will spend the season worksuperstar to do it,” Rockne May 4-5 Howard Wood Relays and a canceled outdoor May 12 ESD (Pierre) 11:30 a.m. said. “Everyone competes on ing to improve their success opener, the Yankton Gazelles May 15 Lincoln Last Chance 4 p.m. an equal level. It’s fun, you’re ahead of the State Shoot in begin the outdoor portion of May 25 State (Sturgis) 10:30 a.m. May 26 State (Rapid City) 10 a.m. Aberdeen on June 9. At state, part of the team and you the season at the Brandon boys and girls are broken into know your score is going to Valley Invitational on April 7. their own divisions (novice, count.” provement out of the middle junior varsity and varsity), And Yankton’s team — distance/distance group, which shoots at the Jim River but their scores are tabulated and has big expectations of into one team score. Trap Range east of Yankton The Yankton Bucks’ roster Wermers in the hurdles, JurAccording to Rockne, this — also continues to grow. boasts more seniors than it rens in the jumps and Mors Yankton’s 50-person roster year will be the first time has in a number of years. The in the high jump. there will be a national shoot, includes 37 returners (32 experience won’t be enough “We’re not two, three Senior Ray Wermers returns for the Bucks after qualifying boys and 5 girls) and 13 new- for the top 1400/1500 scores to completely turn around deep, but we want to be for state a year ago. in the country — they will comers (12 boys and 1 girl). the team’s 17th place finish capable of placing in every travel to Lansing, Michigan, “It will be one of the bigat state a year ago, but it’s event,” he said. “We have in mid-July. gest teams in the state, by a step in the right direction, guys who can compete.” and I have laid down is team. A month earlier in the No matter where Yankton far,” Rockne said. “The kids according to Youmans. Youmans is hoping that exciting,” Youmans said. “It’s same arena (Denny Sanford shoots, safety is the top conhelp promote it. They’ve “You have to go back to this is the group that puts been telling their friends and cern, Rockne said. the ESD championship teams exciting to have guys step up, Premier Center in Sioux the Bucks back on the road not just for themselves, but Falls), eighth grader Owen Each participant has to other kids at school how before you saw the makeup for others.” Warren earned a state tourna- to success. pass the South Dakota hunter much fun they had.” of a team like we have this “I keep telling our guys Also back with state meet ment medal in wrestling for safety course, and then wears Back to the roster are year,” he said. “One of the that somebody gets to be the the following boys: Joseph experience for the Bucks the Bucks. eye and ear protection during problems with our boys’ group to change it. I feel this Andrews, Bryce Bakely, Dilare junior Hunter Antrobus, “There’s an old Bob competition. Participants teams has been that we group is excited to change sophomores Ryan Eichacker, Winter (former Yankton also don’t handle the guns lon Barger, Tanner Barger, haven’t had senior leaderthe culture,” he said. “This Cole Rumsey and Mason activities director) adage, until it’s their time to shoot, Ethan Bradwisch, Brody ship. We haven’t had guys is a team that can be better Welker, and freshman Austin ‘Success breeds success,’” and the guns aren’t loaded Burgeson, Jimmie Cunningmentoring younger athletes, Frick. Youmans said. “We want guys than last year, and that’s the until that point. Range safety ham, Garrett Cutler, Jared and it’s been detrimental to focus: improvement. EveryHaving athletes who that know how to win, that officers are also on hand durCutler, Reid Dutrow, Caden our boys. thing we do will be focused are hungry to win. We want Ekroth, Bradley Hento, Gaige ing shooting, Rockne added. “There is a strong correla- have experienced success that determination, that grit, on improvement.” “It’s a very professional Koster, Caleb Mastalir, Ryan tion between veteran leader- is an added bonus. Jurrens, Wolfgram and freshman in our team. It makes a huge and safe environment,” he Moderegger, Teagen Myers, ship and success, it doesn’t Follow @JCimburek on Matthew Mors all played key deal having those guys that Johnny Neu, Zach Neu, Dylan said. matter the sport.” Twitter. roles on Yankton’s state boys’ know how to win.” Ridgway, Hunter Rockne, That experience basketball championship Youmans expects imFollow @jhoeck on Twitter Cole Rumsey, Mason Ruzicka, includes three seniors who Jack Sasek, Nathan Sawtell, competed at the state meet a year ago: Ben Jurrens, Oakley Palmer and Ray Wermers. Other seniors competing for the Bucks this season are Nathan Eichacker, Jaxon Erickson, Tanner Fitzgerald, Herren • Schempp Josh Galvan-Hofer, Lance Haak, Tate O’Hara, Trevor Building Supply Matthew D. Catherine Charlies C. Michelle Chaussee, Amy Fluit, Rafferty and Jack Wolfgram. 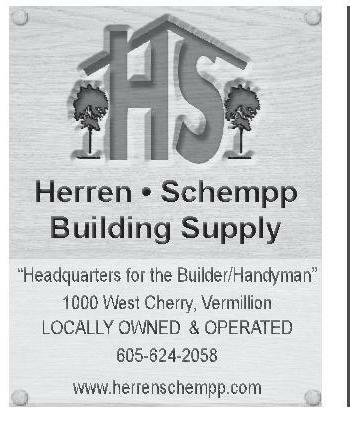 Krell, MD, FAAP Mitchel, MD Yelverton, MD MPAS, PA-C MPAS, PA-C “Headquarters for the Builder/Handyman” “The past few years we 1000 West Cherry, Vermillion have talked about changing * BOARD CERTIFIED S. W. Cherry Street LOCALLY OWNED & OPERATED OPERATED that dynamic. 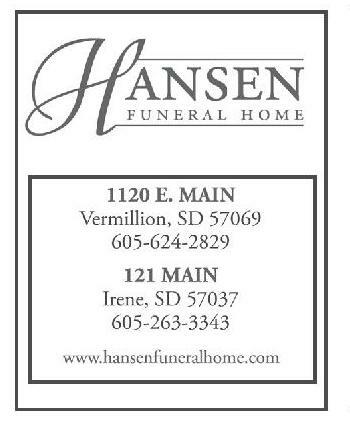 Having these Vermillion, SD 605-624-2058 guys step up and accept the 605-624-4444 Audiology Nephrology Pulmonology www.herrenschempp.com challenge that our coaches BY JEREMY HOECK jeremy.hoeck@yankton.net YHS Track Boys S GO TANGER Our Team is Here for You. PEDIATRICS FAMILY MEDICINE FAMILY MEDICINE BOARD CERTIFIED BOARD CERTIFIED BOARD CERTIFIED FAMILY MEDICINE FAMILY MEDICINE Visiting Specialists Mead Lumber HENDERSON’S (605) 624-6904 807 Princeton St Ultimate Car Washes 815 Princeton St 921 E Cherry St Jason R. Howe, MS, FAAA, CCC-A Dermatology James W. Young, D.O., FAOCD* General Surgery Jesse L. Kampshoff, MD* 113 W. Main St., Vermillion 1205 CARR STREET • VERMILLION 605-670-0471 blainesbodyshop@gmail.com 605-624-2655 2409 Broadway, Yankton 605-665-9651 Byron S. Nielsen, MD* Lori A. Hansen, MD, FACP, FACCP* OB/GYN Rheumatology Orthopedic Surgery George Fournier, Jr., MD, FACS* Curtis M. Adams, MD* Jill F. Sternquist, MD* Jeremy Kudera, MD, ABOS* Call today to schedule an appointment! 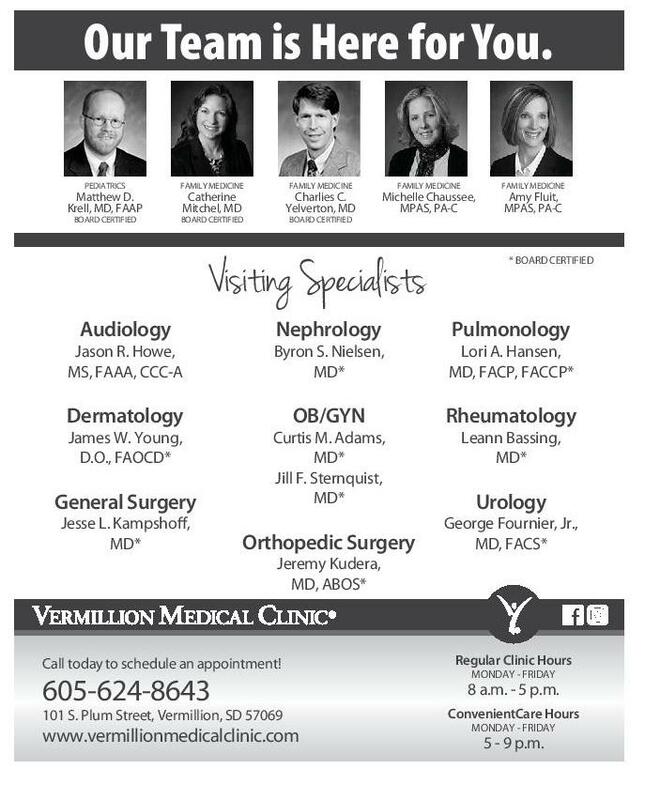 605-624-8643 101 S. Plum Street, Vermillion, SD 57069 www.vermillionmedicalclinic.com Leann Bassing, MD* Urology Regular Clinic Hours MONDAY - FRIDAY 8 a.m. - 5 p.m. ConvenientCare Hours MONDAY - FRIDAY 5 - 9 p.m.